Here at Barnsley Hospital we take sustainability very seriously and are committed to providing healthcare that is environmentally friendly and cost effective. We continue to embed a culture of sustainability into our core business to enhance our social, environmental and economic environments. As an acute NHS Trust and a major employer in Barnsley it is important we operate in a sustainable manner. We recognise the crucial role our environmental performance has to play in achieving sustainability for Barnsley, the NHS and the UK. The Climate Change Act 2008 requires the Trust to achieve a 34% reduction in our carbon footprint by 2020 and an 80% reduction by 2050 against our 1990 baseline. 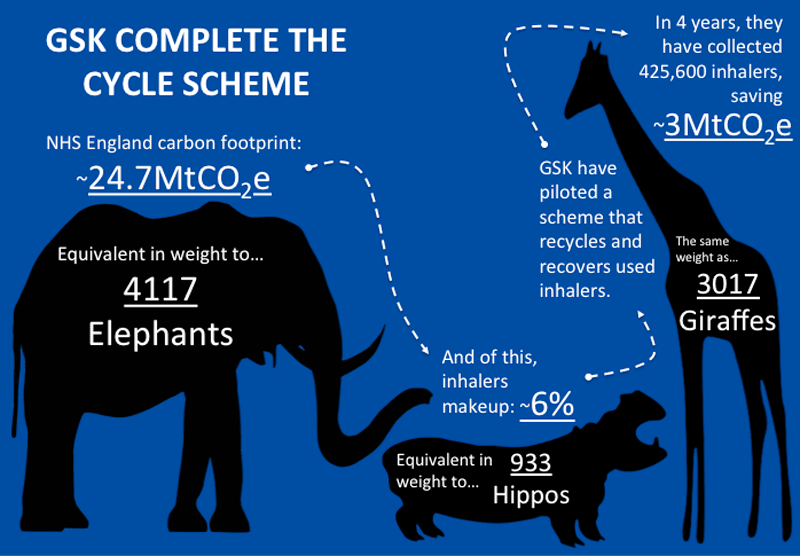 The Trust is on track to achieve our 2020 carbon reduction target. We are committed to continuously improving our sustainability performance and are proud of our achievements. In 2015 we were ranked among the top 20 NHS trusts in the country by Pricewaterhouse Coopers for our sustainability reporting. In 2016, we won the Public Sector Sustainability Award for the Most Sustainable Public Sector NHS Organisation and were runner-up in the Modeshift’s National Sustainable Travel Award for Contribution to Sustainable Travel. 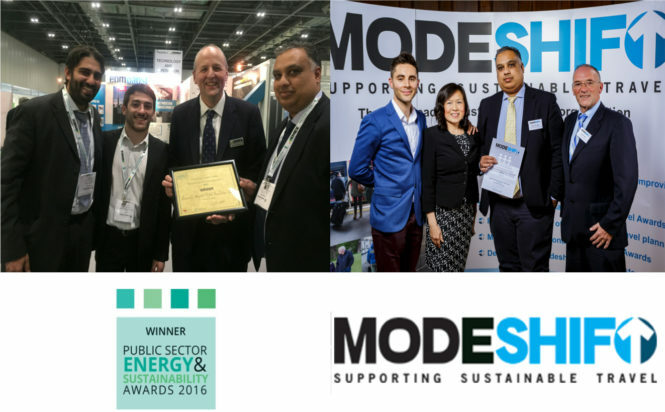 Photos: Lord Redesdale present the Trust team with their PSS Award, and the team collecting their Modeshift runner-up award. This sustainability section has been developed to provide information on some of the work we are doing to improve our sustainability performance and provides ideas on you can become more sustainable. For more information, please explore the sections and click the figures to enlarge them. There is scientific consensus that the burning of fossil fuels (coal, oil and natural gas) to generate energy contributes to global warming and climate change. 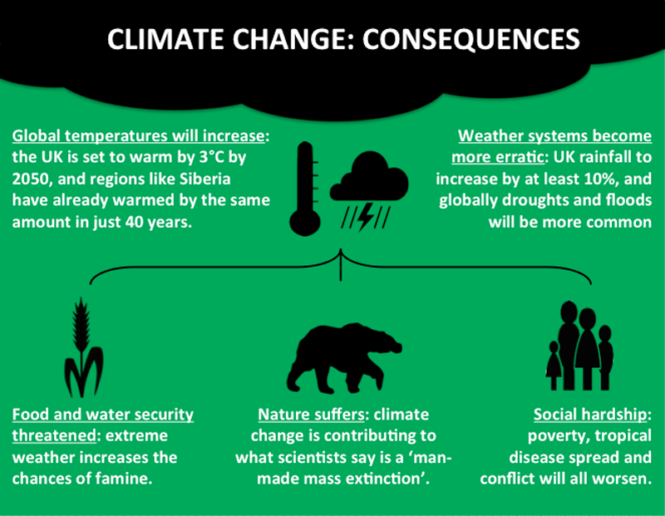 Described as the biggest threat to global health facing the twenty first century by the World Health Organisation, climate change will have a far-reaching impact. Scientists have projected that if nothing is done to reduce our dependency on fossil fuels and curb the resulting greenhouse gas emissions, catastrophic weather events that have hit the UK will become even more frequent and severe. 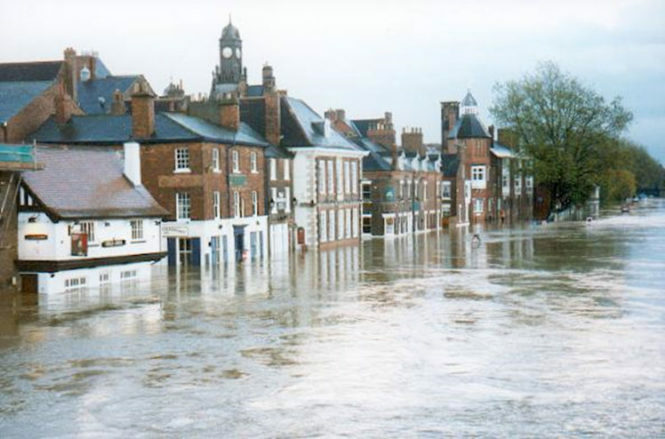 Research has shown that man-made greenhouse gas emissions significantly increased the risk of the flooding in autumn of 2000 in the UK, the wettest since records began, causing £1.3 billion in damages and great social hardship. With yearly average temperatures in Britain set to increase further in this century, and travel becoming evermore popular, the risk of tropical disease outbreaks in the UK is increasing. It is therefore important that the trust is resilient to the effects of climate change and adopt adaptation and mitigation measures and be fully prepared in the event of an emergency with business continuity plans in place. What is Barnsley Hospital doing to mitigate climate change? The Trust’s Security & Emergency Resilience Service has pioneered sustainability and adaptation to climate change in multi-agency exercises involving a number of key resilience partners including police, fire service, local authority, ambulance service, NHS England and NHS Protect. Learning from these exercises is included in severe weather and heatwave planning to ensure the security and safety of staff and patients. Photo: A scene from York during the severe flooding in 2000. The Trust regularly raises the relevant issues to the local Health Resilience Forum that is the key forum into the multi-agency Local Resilience Forum involving stakeholders from South Yorkshire and Bassetlaw. Presentations have also been made regarding both adaptation to climate change and sustainability to a number of national workshops hosted by the Emergency Planning Society. Tip 1: Spread the word. The more people know about the issues surrounding climate change the more action will be taken. Speak to friends and family about the solutions given here and in other sections so that as a society we are as knowledgeable as possible about climate change. Tip 2: Switch to a green energy provider. Renewable technology is now at the point where green energy providers are able to offer very competitive prices and help you drastically reduce your home’s greenhouse gas emissions. Myth busted: Climate change is not occurring because the weather has been especially cold recently. 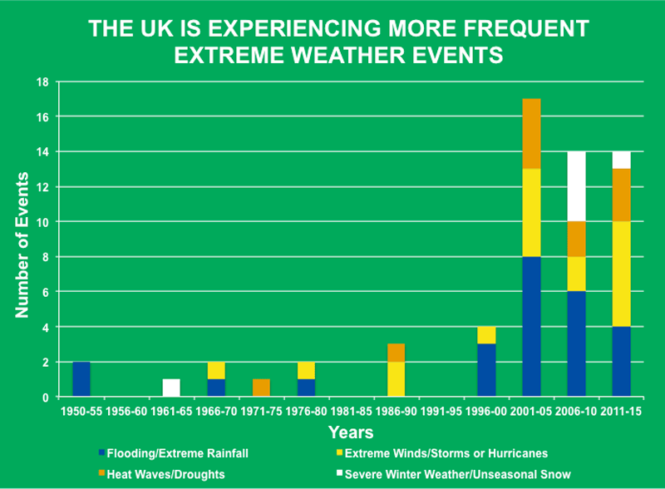 Climate change occurs over timescales of years and decades, and average temperatures have increased dramatically in recent times. NASA have an amazing depiction of this change. Given the Trust’s commitment to reducing our carbon footprint and making saving where possible, improving the way we use energy is imperative to achieving our goals.The extraction and combustion of fossil fuels to generate power come with a wide range of problems. These range from greenhouse gas emissions to oil spills. The Deepwater Horizon spill in 2010, the biggest marine spill in history, poisoned whole ecosystems and decimated regional fishing industries around the Gulf of Mexico. The Climate Change Act 2008 requires the Trust to achieve a 34% reduction in our carbon footprint by 2020 and an 80% reduction by 2050 against our 1990 baseline. The Trust is on track to achieve our 2020 emissions target for emissions related to energy. 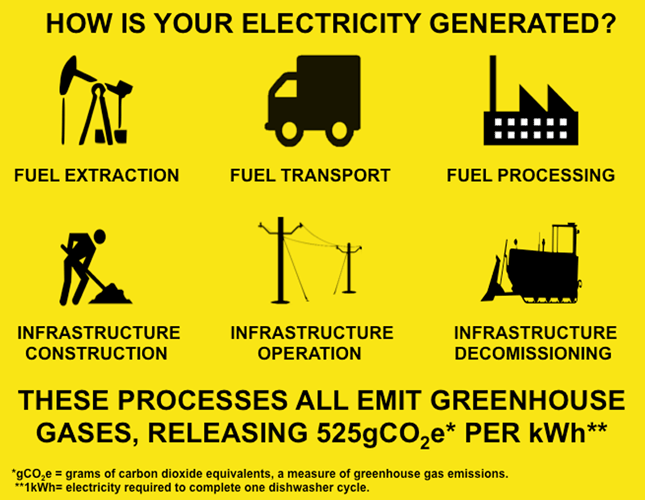 This progress has been achieved through generating our own onsite electricity. 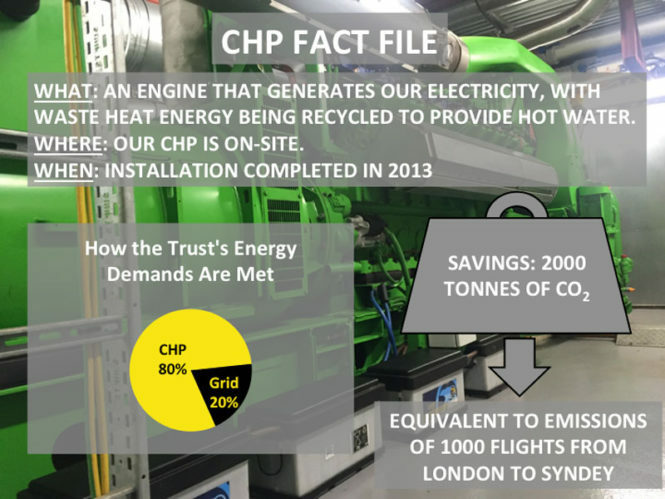 In 2013 we installed a 1,130kW combined heat and power plant, which has helped us drastically reduce our carbon footprint and energy costs. Graphic: The background picture is of the CHP here at Barnsley hospital. Installed energy efficient technologies including LED lighting and controls. New roof insulation and energy efficient windows to minimise fabric heat losses from our buildings. Upgrade of Building Management System (BMS). Installed energy efficient chillers & ventilation. In addition to investing in our infrastructure we are also focussed on improving our sustainability performance through behavioural change campaigns and training. Small everyday things, if turned into habit, can help you save money on your energy bill as well as help limit climate change. Tip 1: Decreasing room temperatures by 1°C reduces energy usage by 10%. Consider adjusting clothing instead of putting the heating on and remember to turn heating off when rooms are not in use. Tip 2: Use natural light to illuminate rooms instead of lights. This not only saves energy, natural light has many health benefits, click here to find out more. Myth Busted: leaving electrical appliances on standby is as energy saving as turning them off. Standby mode still uses electricity, try turning things off completely and see how much you can save. The Trust generates a significant demand for travel through staff, patient, and visitor travel and from deliveries of supplies. 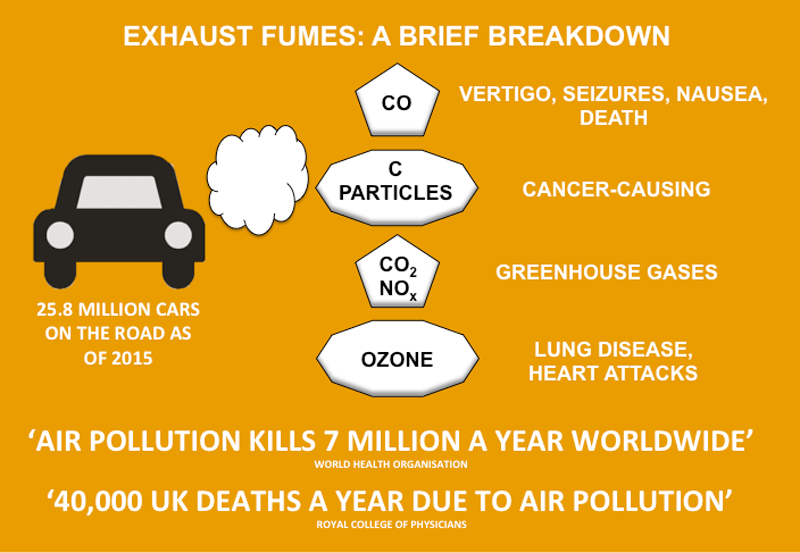 As well as contributing significantly to climate change (63 million tCO2e of the country’s greenhouse gas emissions come from household road transit, see our ‘Climate Change and Energy’ section for more details), exhaust emissions cause air pollution. We actively encourage the use of greener transport modes and promote the environmental, physical and mental health benefits alternatives can bring. Cycling is good for your health, your pocket and the environment! The trust offers a host of cycling-friendly facilities to staff, including providing changing rooms with lockers, bike parking shelters, box cycle lockers and CCTV to help encourage cycling. The Trust works in partnership with Barnsley Cycle Boost, a local council-run initiative to offer free loan bikes for staff use. Photo: Some of the staff and public cycling facilities here at the hospital. We also actively encourage our staff to car-share, as it is a great way to meet new people, save money on fuel and servicing and helps the environment by reducing road traffic. Barnsley is lucky to be very well connected by public transport, providing you with multiple travel options for you to reduce your car usage. Tip 1: the hospital is very well connected by bus and train, see here to plan your journey. 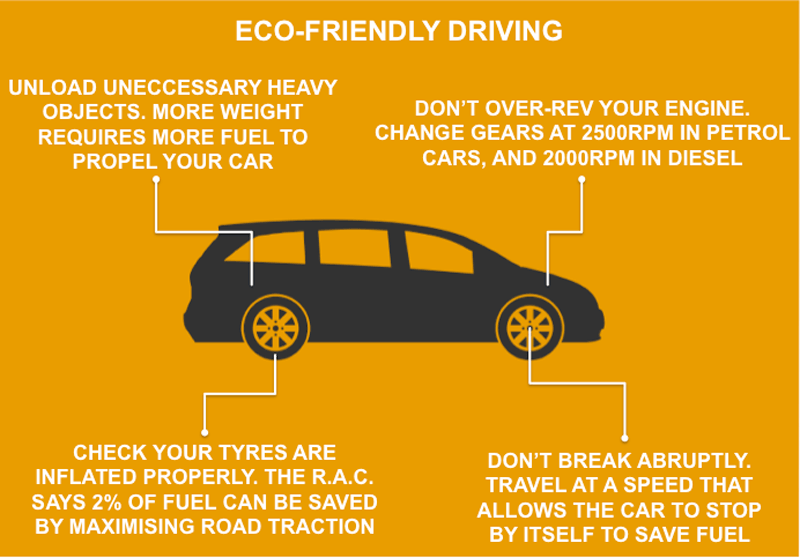 Tip 2: drive in an eco-friendly way. Find additional information on how to do so here. 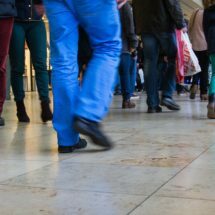 Myth busted: walking isn’t proper exercise. The NHS recommends taking 150 minutes of exercise a week, and walking counts. Walking 10 minutes a day to and from your nearest bus stop gives you almost half your needed weekly exercise! Walking is also great for your mental health, as it gives you time to relax, contemplate and get some fresh air. Click here to find out more about walking. As a trust we generate significant amounts of waste which can be split into roughly three categories, clinical, construction and household. The amount of waste we can control varies depending on the legislation surrounding each category. 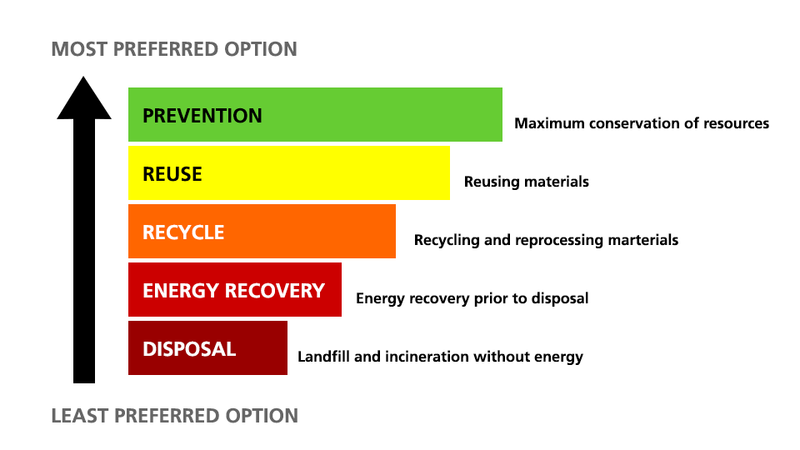 The waste hierarchy represents our priorities when it comes to waste disposal. 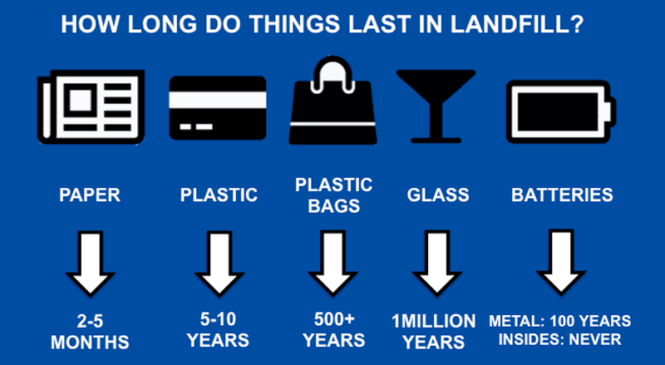 Sending waste to landfill should be avoided at all costs, as landfills are major sources of greenhouse gas emissions (from anaerobic breakdown of materials), toxic leakage and form unsightly landscapes. 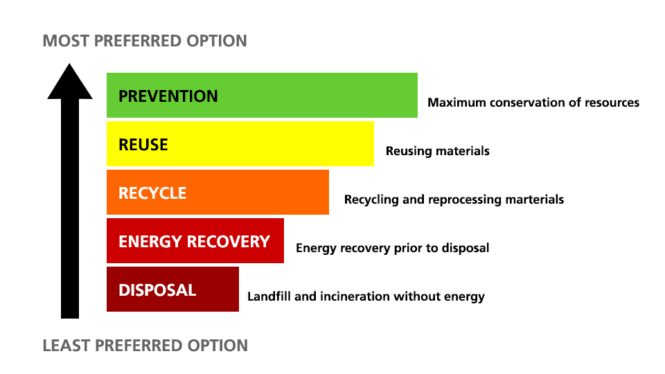 Incinerating or recycling/reusing waste is more preferable as some of the energy and/or raw materials are saved from landfill. However these options still contribute to environmental damage through reprocessing and extraction of virgin raw materials. Waste prevention is optimal, as it natural resources such as forests and mountainsides are left intact. Proper disposal of clinical waste is also important to protect the environment and the public from hazards such as sharp objects, infectious material and body altering chemicals, and so our efforts in this aspect revolve around reducing our environmental footprint and ensuring public safety. The Trust generates a significant amount of household waste. This waste is not sent to landfill but is used to generate energy which is supplied to the regional grid. We have signed up to Glaxo Complete the Cycle take-back scheme that collects used inhalers and recycles or recovers them. Use emails/phone to communicate instead of printing and scan and email documents. If printing is necessary then use both sides of the paper, as well as black white and include multiple pages on a single side. Purchase durable items that are built to last. Return packaging back to supplier. 50% of the waste in the average household dustbin could be composted, and 60% could be recycled. Here are a couple of ways you can reuse and recycle the waste in your home. Tip 1: compost. Utilising a compost heap for your food and garden waste is a great way of reducing your contribution to landfill and helps you save on compost and fertilisers for your garden, greenhouse and/or allotment. More information on how to compost here. Tip 2: Research types of rubbish that can’t be put in the green bin to see if it can be taken to the tip. Many materials and products that can’t be put into green bins can be recycled in specialised ways. Find your local tip here. Myth busted: Recycling an object uses more energy during transport and processing than making it from scratch, therefore recycling is pointless. The vast majority of research shows that this is not the case; recycling one tonne of aluminium saves 9 tonnes of CO2 and requires 95% less energy than making one from raw materials. The Trust recognises that our procurement decisions have a significant impact on the environment, society and the economy. We acknowledge the importance of being responsible, sustainable and ethical in order to meet the needs of the present and leave a better environment for future generations. Sustainable procurement focuses on the way we source our food, goods and services. Improving the sustainability of food and procurement involves sourcing in a cost effective way while reducing our environmental impact and driving social good in the community through suppliers. Our trust-wide sustainable procurement policy embeds sustainable practice in all future procurement endeavours. It ensures, to the best of our abilities, in any future procurement decision things like Fair Trade goods, local suppliers and reduction of demand are all prioritised. We have also introduced e-procurement processes to reduce paper waste in internal procurement operations, reducing our carbon footprint and helping to protect forests. Our utilisation of the NHS Supply Chain has also increased, bringing with it further commitment to its sustainability goals. 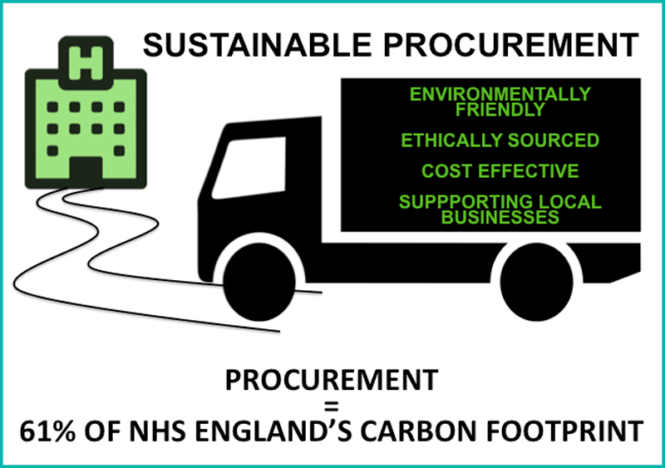 The NHS Supply Chain guarantees sustainability in their operations and procurement, using fuel-efficient delivery fleets and ethical sourcing that upholds labour standards for a wide range of supply types. 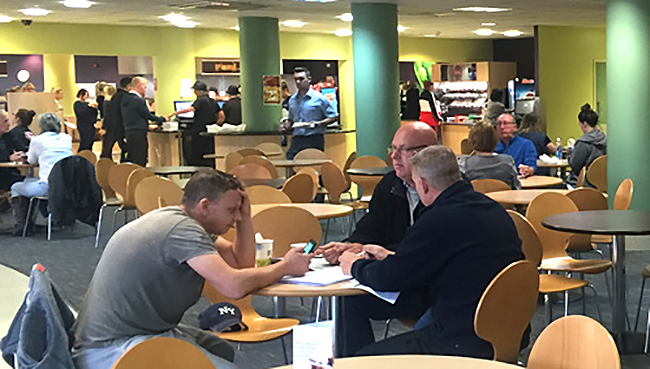 Working with our partners in catering, such ISS catering and Costa Coffee, we provide sustainably sourced food and drink to patients and visitors to the hospital. Tip 1: Support your local butcher. Now a dying breed, local butchers are a great way to sustainably source your meat as their supply chains are often shorter and so use less fuel and have smaller carbon footprints and the meat is often fresher!This also helps you support the local economy. Tip 2: Grow your own fruit and vegetables. Most of the food we eat has travelled hundred or even thousands of miles. 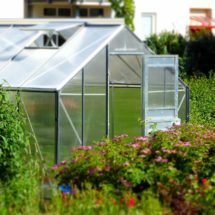 Growing fruit and vegetables in your garden or allotment is a rewarding way to save money and sustainably source your food. It reduces food miles, reduces your impact on the environment and it will also give you pleasure from growing your own food. Find more information here. Myth busted: Fair Trade is a scheme that only shifts the costs onto buyers. Alongside helping the most impoverished farmers on the planet escape exploitation from brokers, Fair Trade also trains farmers to be more sustainable and fosters social initiatives like providing improved healthcare services and childhood education. Click here to find out more about Fair Trade. The Royal Society states that “rapid and widespread changes in the world’s human population, coupled with unprecedented levels of consumption, present profound challenges to human health and wellbeing, and the natural environment”. Sustainable behaviours are intrinsically linked to health and wellbeing. We are seeing how improving our relationship with nature is good for us as a society, physically and mentally. In being sustainable, we are also providing future generations with the framework and opportunities to lead happy and healthy lives. How can you improve your health and wellbeing? On the global scale, our efforts to reduce our carbon footprint help to reduce climate change, the process most scientists agree will pose the greatest threat to global health this century. However, there are many ways in which being sustainable can improve your day-to-day health and wellbeing. 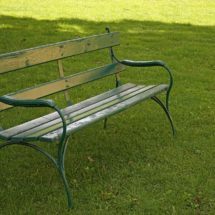 Green spaces, such as gardens and parks, are first of all environmentally friendly. They are havens for wildlife in cityscapes and help to protect against natural disasters, noise and air pollution. From the ancient Japanese practice of shinrin-yoku (forest walking) to the Yorkshire industrialist Titus Salt’s factory placement, the health benefits of green spaces have been known across the world for time immemorial. In Philadelphia, USA, a study found that maintaining city parks gave over £58 million in healthcare and social cohesion savings. Green spaces encourage communal exercise and relaxation. There is evidence showing that use of green spaces by children with ADHD can help reduce symptoms and a study from Japan found that access to walkable green spaces reduced inequalities in the life expectancy of the elderly. For more evidence of the health benefits of green spaces please click here. 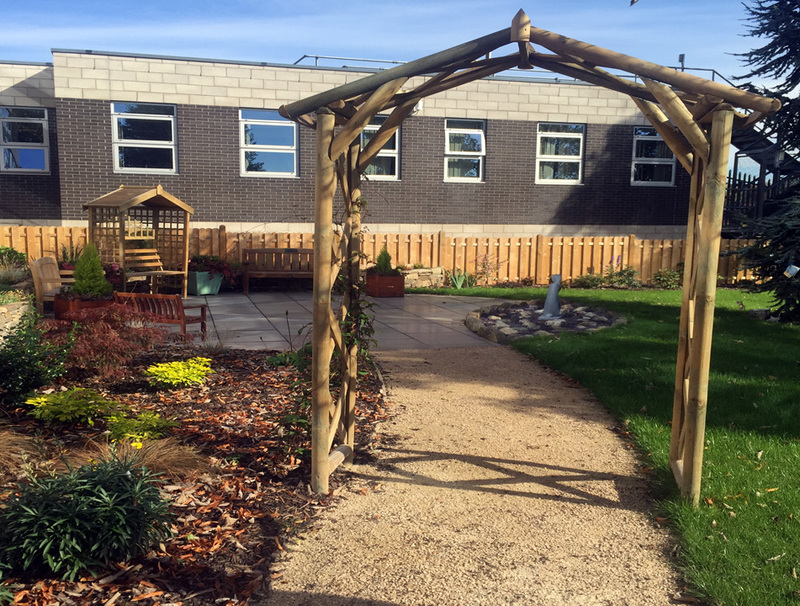 At the trust we provide a garden for families in memory of lost infants. It is a peaceful green space for remembrance, reflection and the enjoyment of nature. Covered in the ‘Food and Procurement’ section, eating sustainably not only helps save the environment but is healthier than the average diet. If you are currently eating unhealthily you can do the following things to both improve your health and be more sustainable. In 2014, 61.7% of adults were either overweight or obese. Eating less helps to reduce your weight and the health problems associated with it, such as diabetes and some types of cancer. Environmentally, it prevents wild lands from being converted to farmland, saving wildlife and the atmosphere from habitat destruction and greenhouse gases respectively. Eating over 90g of red meat a day increases your risk of high cholesterol, with processed meats (such as sausages) classified as cancer-causing by the World Health Organisation. 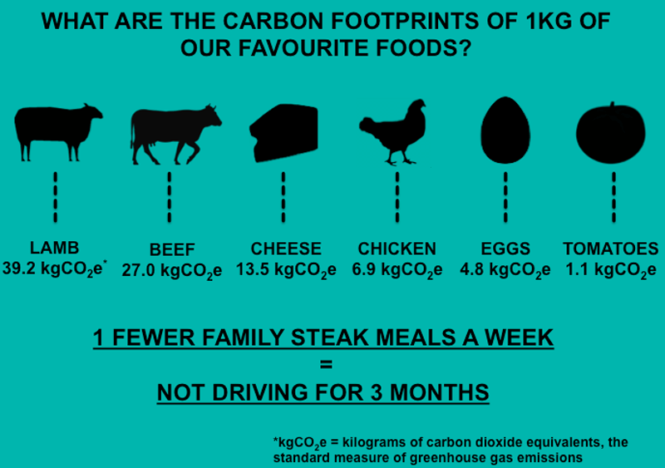 It just so happens that many sources of red meat, such as beef and lamb, are the least efficient and most environmentally destructive protein sources to rear, so cutting down is doubly helpful. The trust provides vegetarian options in all hospital cafés. Growing your own fruit and vegetables and supporting your local butcher saves fuel emissions and reduces pesticide usage in industrial farming. It also helps you support your local businesses and in the case of growing your own food, spend more time outside in a green space. The trust aims to source produce from local suppliers. 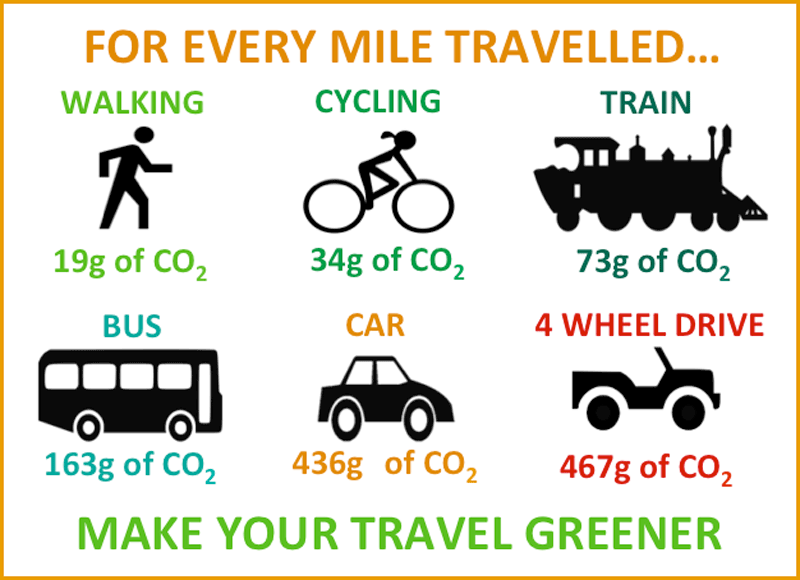 Covered in the ‘Transport’ section, walking or cycling instead of taking fuelled transport is a great way of reducing your carbon emissions. Sitting down for over 3 hours a day is thought to reduce life expectancy, whereas walking and cycling come with a whole host of health and wellbeing benefits. Additionally, there are many walking groups around Barnsley to get involved with, click here, here and here to find one that suits you. Photo: the hospital’s memorial garden acts as a relaxing green space.